Exporter of a wide range of products which include sofosbuvir and ledipasvir tablet, sofosbuvir tablets and daclatasvir tablet. We are leading Exporter and Manufacturer of Sofosbuvir And ledipasvir Tablet. 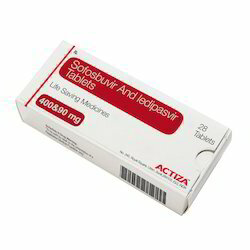 Sofosbuvir And ledipasvir Tablet exporter in India. We are leading exporter and manufacturer of Sofosbuvir Tablets. Sofosbuvir Injection exporter in India. We are leading Exporter and Manufacturer of Daclatasvir Tablet. Daclatasvir works by lowering a load of hepatitis C virus in the body and removing the virus from the blood over a period of time. Daclatasvir Tablet exporter in India.